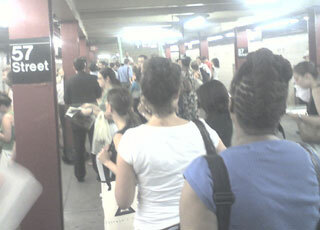 It’s another hot day in the city and waiting for a subway train is like taking an excursion into hell. Fortunately, I do not mind the heat so much so I am making it through ok. What killed me though was yesterday’s interminable wait for a subway train, since it appeared that they were taking a break. The platform was mobbed and filled with hot and sweaty people. To make matters worse, once I finally boarded a train, I found myself standing next to a pair of overweight, classless, gum cracking lesbian latinas. They were standing practically on top of me and I was treated to a close up view of them playing with their gum and brushing up against each other. At one point, the larger of the two dropped her gum as she was trying to stick it to the ceiling of the train. It narrowly missed me and fell between my feet and that of another passenger. Eventually the seat next to me opened up and the pair of them sat down right beside me, with one sitting upon the lap of the other. I could only be amused at my fate as I listened to them cackle and make fun of just about everything. The site of their plump overweight bodies should have inspired me to get up and exercise this morning, but for some reason I just didn’t feel like it. I asked myself which would give me pleasure; going back to bed or riding 18 miles in the heat. I opted for the air conditioned comfort of my bedroom and blissfully fell back to sleep. I just completed an Ironman a week previously and I deserved to goof off a bit. I’ll get back on track tomorrow, I promise.